I have been thinking about making cookies for about a week, because I have been craving a sweet little treat and we had nothing dessert-like in the house. I didn’t feel like making your standard drop cookies either. I wanted to make something special, something different, intriguing and unusual. Something that would elicit a “How in the heck did you do that?” response. Well, I think these cookies fit that description to a tee. It was so much fun to follow the various steps and see those neat little checkerboards appear at the end. And they taste so good, too. Yummy. The vanilla and chocolate dough are each rolled out into an 8×12-inch rectangle. 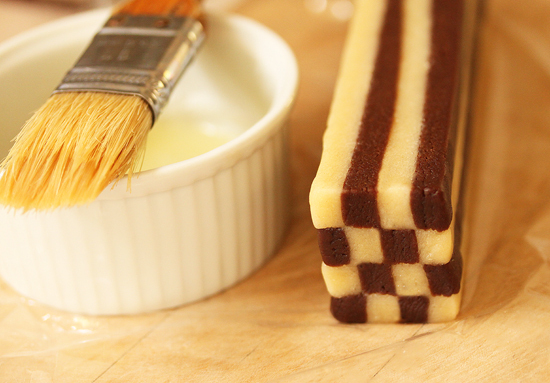 One is painted with beaten egg whites and the other dough rectangle is placed on top. This is then cut in half into two 6×8-inch rectangles. Which, again, is painted with egg white and the other half placed on top, creating a four layer block of dough. The four layer block of dough is sliced into 3/8-inch slices. These are brushed with egg white and four are stacked together. 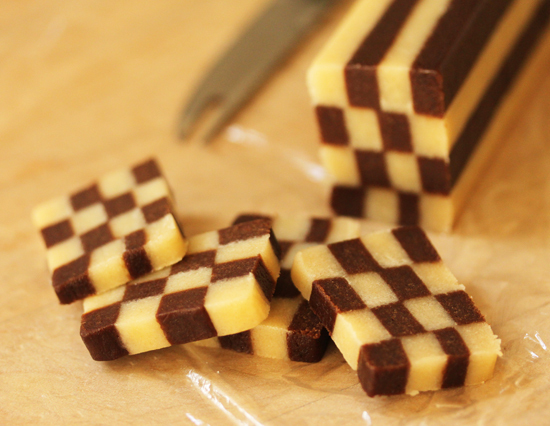 Each slice is turned over so the dark squares alternate and the end looks like a checkerboard. 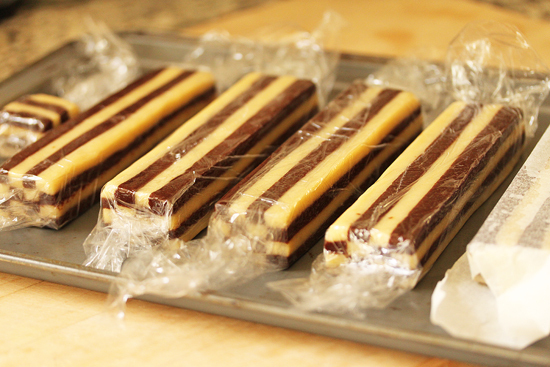 The remaining slices are formed into four layer stacks and wrapped in plastic wrap. Then they are chilled for several hours and up to three days. Or frozen for future use. Each stack is sliced into ¼-inch slices. I think these look so… cool! The dough slices make an excellent pattern on the cookie sheet. And then there are beautiful little goodies to eat and share. This is the best part. 1. Unwrap the Vanilla Cookie dough and roll it out on a floured parchment sheet on work surface into an 8×12-inch rectangle about 3/8-inch thick with square corners. Slide dough on parchment onto a cookie sheet, cover securely with plastic wrap and refrigerate for about 30 minutes until firm again. Do the same with the Chocolate Cookie dough. 3. 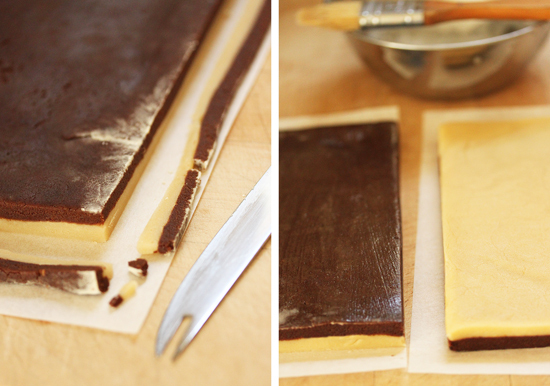 Cut the dough rectangle in half through the parchment so you have two 8×6-inch rectangles. Paint the top of one rectangle with egg white and put the second rectangle on top so the four layers are alternating black and white. Press gently with pan to help stick together. 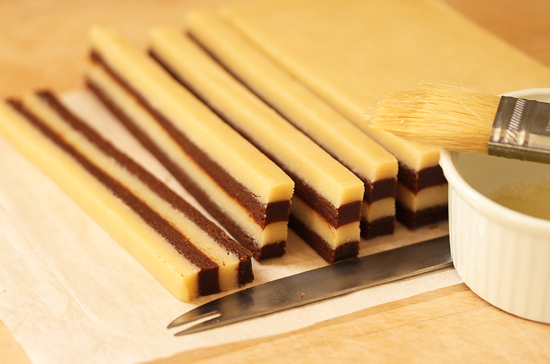 With a sharp knife, trim the four sides so they are straight and square. Wrap and chill for several hours, keeping the corners square. 4. Place unwrapped dough stack on cutting board with the 8-inch side facing you. With a sharp knife, cut the 6-inch side into sixteen 3/8-inch-thick slices. 7. Preheat the oven to 350 degrees F with racks in upper and lower thirds of the oven. 8. Slice the cookies ¼-inch thick, turning the stack after each cut so it doesn’t become flat from the knife pressing down. 1. In a large bowl, beat the butter, sugar and salt with a fork until well mixed, light colored and fluffy, about 2 minutes, then beat in the vanilla and egg yolk. Keep beating until very smooth, about 2 more minutes. 3. Scrape dough from the bowl onto a lightly floured work surface and press into a 1-inch-thick square. Wrap in plastic wrap and chill until firm, several hours or up to 3 days. 5. Form the dough into a ball and press into a 1-inch-thick square. Wrap in plastic wrap and chill until firm, several hours or up to 3 days. These look so beautiful. I’m not sure I have the skill (or the patience) to make these, but I love looking at them. Thanks for the step by step process too! This is absolute unique creation .. haven’t seen any cookies as different as this. Just too gorgeous. I am saving this to try sometime. Am exhausted just reading the steps! Thanks, but I will be using my OCD traits to line up my pairs of shoes while you’re making the magic. Those look awesome! 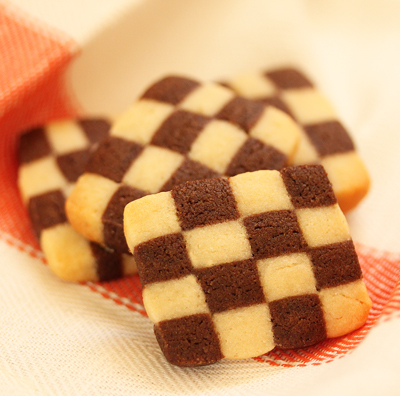 I’ve wanted to make checkerboard cookies for so long. Yours look so good Love the step by step! These look beautiful. What an intricate cookie. Almost too pretty to eat. Almost Thank you for sharing this recipe with me. I hope you are having a blessed week, my friend. Much love! I have a recipe for these cookies and I’ve yet to attempt it – but they are so beautiful that I may just have to try them!! These are simply gorgeous – I’m only (THREE) months away from getting my oven back, and I’m already looking forward to trying this. Looks like you’re a very meticulous person. Those lines are precise!!!! Gosh they look so perfect! Will have to try this recipe! Is it a mistake that it’s only the Chocolate Cookie Dough that has baking soda in it? 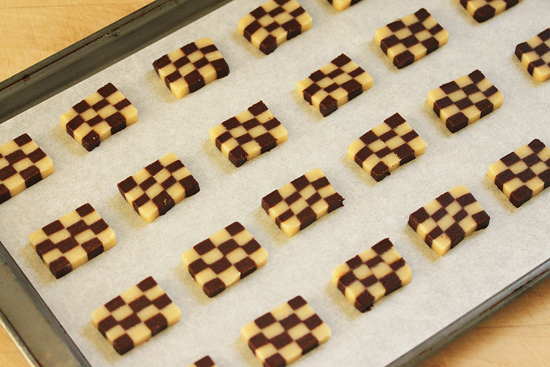 The recipe was great, although I probably need to practise a little bit – they didn’t come out as perfect as yours. I notice that most of your mixing, you use a fork, can I use a Kitchenaid with this cookie and the others where you’ve used a fork to mix. Thanks. 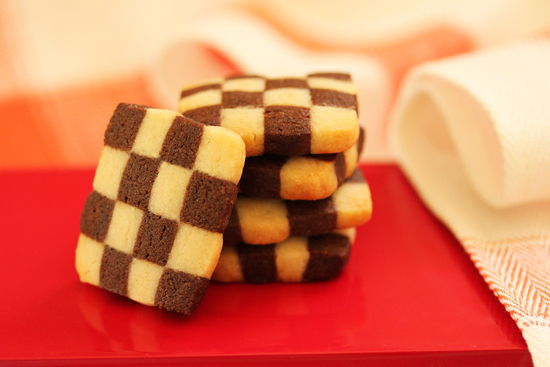 My teenaged daughter made these checkerboard cookies and we put them in Christmas gift baskets for family. They can’t stop emailing and texting about these cookies and how they want more. I wanted to ask … what if you are NOT using chocolate or you ran out, can you make 2 vanilla dough and colour one using food colouring? Hi, would it still come out great if I use half the ingredients to make the dough ? Should I still use the full egg? These are so beautiful and perfect. We did some that were green and red in our Cookie Baking Class on Saturday. Not as perfect as yours. I’m impressed. My husband’s mother always made these special cookies at Christmas time. Sadly, she passed away this year. This Christmas my husband and daughter are going to try to make them. They are a family favorite and a “heritage” cookie that will be made in her honor and in remembrance of her. Thank you for the step-by-step directions! Does the dough have to be refrigerated for two hours (or more)? What if I stuck them in the freezer for half the time? Or is it specifically supposed to be refrigerated? I was looking for similar recipe. My mother in law used to make them for us during summer or X’mas. They are my favourite. She passed away this fall . Didn’t get a chance to ask for the recipe, but found this one. My hubby said they tasted like his mom’s! So I was happy. She would’ve been so proud, since she usually made 4 blocks. I did a rectacle 12 blocks! Received so many compliments! Will be the star on our X’mas celebration this year!